I think the last time we took a picture with the three of us it was Christmas, and that was only because Grant's mom hired the photographer and coordinated it all. For some reason we're just not good at getting pictures of all of us together. But today monkey woke up from nap and wandered into the office while Grant and I were gaming. He then grabbed the camera off the desk and insisted Grant snap a photo of us all together. So here we are. 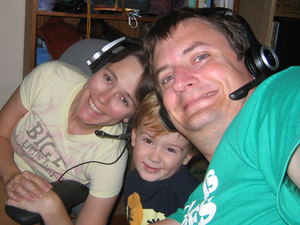 The family that games together stays together I guess. Saw your post about the H0ME Warranty company. Can you email me? Any interest is a suit against these guys? Now that's a classic photo. This page contains a single entry by published on September 23, 2009 6:40 PM. Summer Blur was the previous entry in this blog.